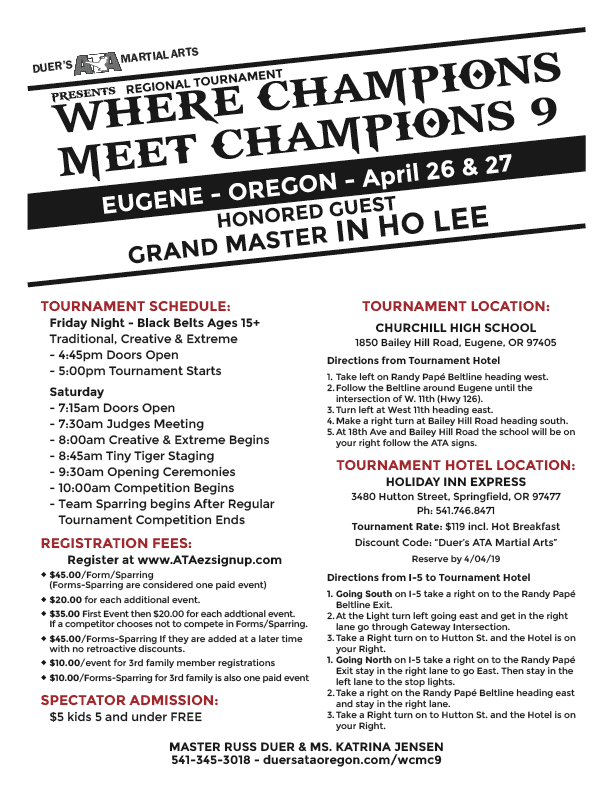 Where Champions Meet Champions Tournament IX is right around the corner, April 26-27. 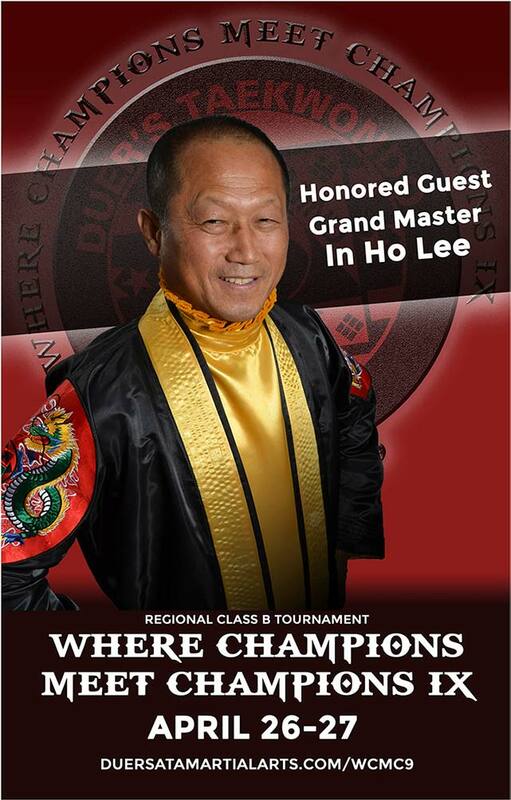 We are proud to announce that Grand Master In Ho Lee will be attending this tournament, one of the few remaining ones he will visit as Grand Master. There will be a Regional Testing for Recommended Black Belts to 6th Degree Black Belts on Friday the 26th at Duer'sATA Martial Arts school location starting at 12pm. This is a great opportunity to mid-term or test for rank. We look forward to having competitors from around our region competing to qualify for State, District and World Championships. With this being one of the last local tournament before Districts it is the perfect competition to earn your last points of the year. We will be using ATAez SignUp.com system to register competitors. $20.00 for each additional event. $35.00 First Event then $20.00 for each addtional event. If a competitor chooses not to compete in Forms/Sparring. $45.00/Forms-Sparring If they are added at a later time with no retroactive discounts. Click the buttons below to download the Tournament Posters and Tournament Information Sheet. You can print these files out. You can also register for the Tournament Online using the far right button. If you have previously registered on www.ATAEZSignup.com, DO NOT create a duplicate account. If you forgot your password, the system will resend you a temporary one. If you forgot your username, ask you school owner to look up your information under their school owner profile. Once logged into your account, please update your competitors rank, age, height, and judging level. Select your school owner from drop down menu & type in school name (if your school owner isn’t listed, please select ‘other’ at bottom of the School Owner list then type in your School Owner & School Name). Note for 3+ family competitors: If you are in Oregon, make sure your instructor groups you as family. If you are not in Oregon please Email info@atacottagegrove.com so we can make sure you get your family discount. Visit the “Tournaments” tab and select “Region 119B Tournaments”. 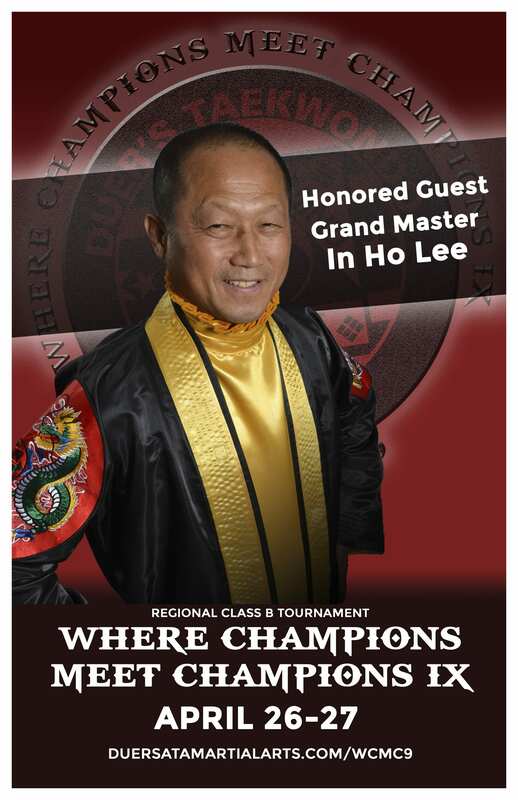 Scroll to tournament you wish to compete in and select “Register” [Select events you wish to register for, confirm all information correct, enter competition rank & if Novice, Special Abilities or ATA Tiger per your instructor]. Once all are checked at Main Tournament Registration page select “Pay Registration Fees” at the bottom of the page. Confirm your fees on “Payment Summary” then select “Make Payment”. You’ll be directed to PayPal to finalize your transaction. Once your registration fees are paid, select “Print Form” next to each event you’ve registered for. Make sure you fill out the waiver and BRING TO THE EVENT WITH YOU. There is a QR code on your form that will confirm your attendance and payment. QUESTIONS? Please contact Erin Lauraine at info@atacottagegrove.com or (541) 942-0215. You can also visit us on Facebook at www.facebook.com/OregonATA.